Technology Conference Bingo Take #2! Last month, I created a Social Media Bingo card that I shared at a conference on social media. It sparked some interest but it need some more development as it was done very last minute. So here is my second go round with Technology Conference Bingo, revised and some rules added in to make sense of it. Click on the image to get a better version! The Bingo slot (use numbers and letters, e.g. "N2"). 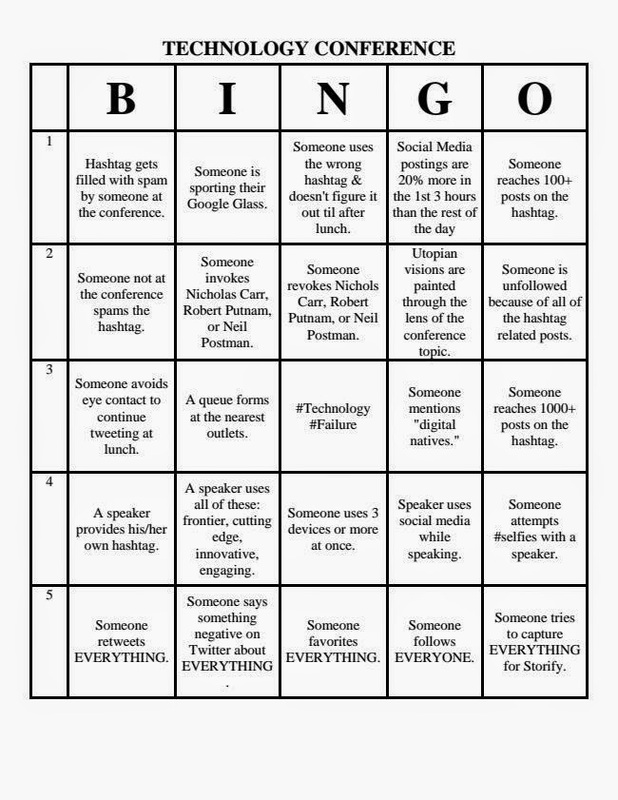 Use the tech conference & #TCBingo hashtags. Tag the Game Judge (person should identify himself/herself early in the conference but using the conference and TCBingo hashtags. 3. The first person to fill a row (horizontal, vertical, or diagonal) should tweet out: "I win! [Conference Hashtag] #TCBingo with [provide full listing spots claimed: "N1, N2, N3, N4, N5". 4. In order to claim a win, you had to have actually posted captured slots as you went along (that is, you can just sum up at the end). 5. Judge will confirm winner. Award (real or imagined) prizes (if they are offered). You can find all of this in a more pliable form at this link and if you wish to comment on the actual Bingo for critiques or other ideas, you can also do that here.